Stratford-upon-Avon01789 264 293work TownThe picturesque market town of Stratford-upon-Avon is the home of William Shakespeare. This is Shakespeare's England. Swans glide gracefully along the River Avon, willow trees overhang the water's edge, barges move slowly around the canal basin and the distant spire of Holy Trinity Church completes the perfect English landscape. Holy Trinity Church is where Shakespeare was baptised and buried. The church is a quiet place to begin or end your Stratford journey. It offers a place for reflection and a time for peace. Lying along the banks of the river, it is just a short distance from one of Stratford's best landmarks, the Royal Shakespeare Theatre. Discover everything you ever wanted to know about Stratford's favourite son in the five Shakespeare Houses around the town. Imagine what life was like for Shakespeare in the house where he was born and bred. Explore the thatched cottage of Anne Hathaway where he wooed his wife to be. Visit the luxurious home of Shakespeare's daughter at Hall's Croft. Experience the sights, sounds and smells of a Tudor farm at Mary Arden's. Explore the Shakespeare Houses and other Stratford attractions on City Sightseeing open top, hop-on, hop-off bus tours. You can really immerse yourself in culture and the arts in Stratford. With theatre, music, festivals, art galleries and sculpture displays, there is much to appreciate throughout the year. Enjoy the sounds of the Stratford Music Festival. The Civic Hall also offers an exciting cultural programme with opera, dance and drama. Shakespeare aside, there are many other superb attractions to enjoy in Stratford-upon-Avon. Wander round the lush landscape of the Butterfly Farm, spend a day at the races or play mini-golf. 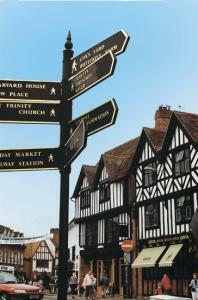 The picturesque market town of Stratford-upon-Avon is the home of William Shakespeare. This is Shakespeare's England. Swans glide gracefully along the River Avon, willow trees overhang the water's edge, barges move slowly around the canal basin and the distant spire of Holy Trinity Church completes the perfect English landscape. The town has a great range of quality shops, from antique centres, speciality cheese shops and independent boutiques to contemporary jewellers and popular fashion stores. Its excellent selection of first class shopping and dining, combined with world-class culture, make Stratford-upon-Avon the perfect choice for a short break or longer holiday.